“... I have had the time of my life..” Liz Walker, Stirling. For the beginner or more accomplished painter these courses and classes are designed to benefit and inspire all. Tim Hall has taught in London and Esher for over 10 years before moving to Cornwall 14 years ago, and is fully qualified in a multitude of media. 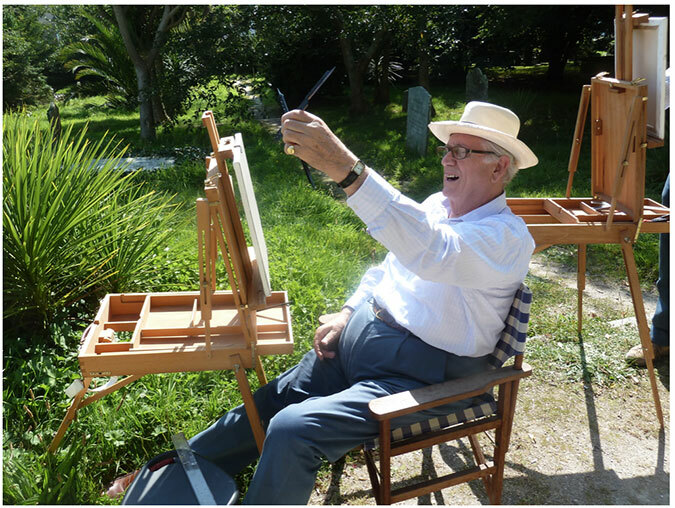 A comprehensive tutelage in all aspects of painting and drawing is available. The courses/classes begin in The Newlyn art studio. Here you will meet your tutors in a relaxed and friendly atmosphere and discuss the outline of your tuition. We are motivated to break down all fears and insecurities that can present themselves to the painter, whether that be fear of painting in public, working from life, unknown media, the list is bountiful as are the solutions! 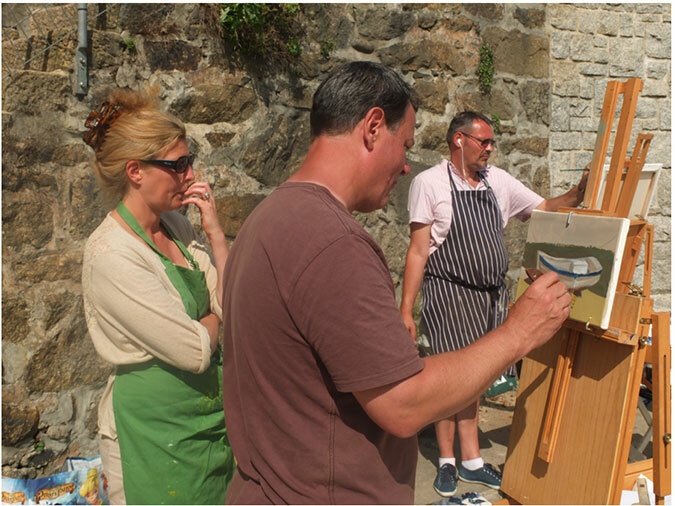 Students are encouraged to paint outside at one of the local beauty spots such as the picturesque harbour village of Mousehole or the majestic St. Michaels Mount. There are also extensive and varied demonstrations and exercises from the studio. 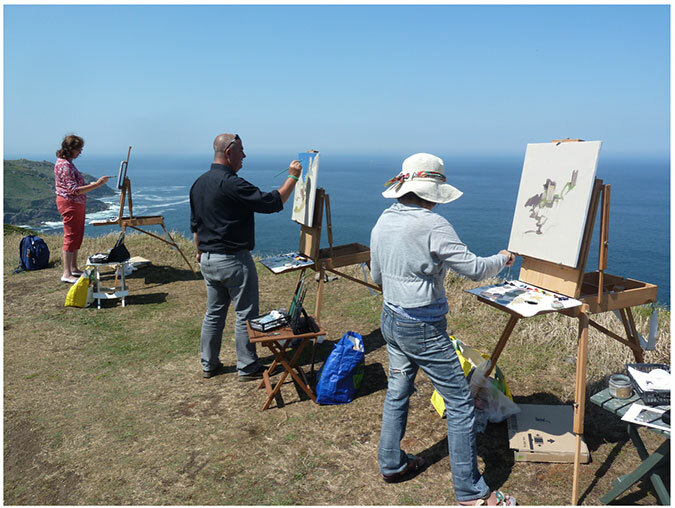 Cornwall has long been regarded as a haven for the painter with panoramic coastal views, coves, caves, valleys and woodlands. Marine subjects are abundant with Newlyn and St. Ives nearby. “ I came to this course from N.Z....I expected a lot, but Tim, you made it all possible! You made it such fun I could hardly bear to stop painting at the end of each day!! Gill Hubble, Auckland. N.Z. We can also offer a selection of B&B’s, holiday cottages in the nearby seaside village of Mousehole. Or at The Old Coastguard Hotel in Mousehole, which boasts an award winning restaurant and superb sea views. These holidays are not restricted to just painters, non painting partners will find an abundant array of activities nearby such as yoga, golf, surfing, fishing, hiking or just lying on one of the many beautiful beaches, come on your own or with friends. We are confident that you will enjoy your stay, diligent tuition, stunning and comfortable surroundings and a chance to make new friends. Address: 12-14 Fore Street, Newlyn. Penzance, Cornwall, TR18 5JN. Address: The Swordfish, Newlyn, Penzance, Cornwall. TR18 5BD.